Pokemon Omega Ruby and Alpha Sapphire owned by Nintendo. - First up: HMs. To get through this area you'll want Surf, Dive, Strength, and Rock Smash. Don't try to come down here without those moves. Just sayin'. You'll also want pokemon that are good at countering the villainous team's usual rosters, 'cause there will be a lot of Grunts down here. - After Diving and popping into the Cavern proper you'll come up near a familiar submarine. Land on the beach, then check the edges of the initial area of the Cavern. If you follow the shallows to the southeast you'll find a hidden Heart Scale. - Enter the cave in the north. Straight ahead and to the right in the next area is a massive boulder. You can push it aside to continue north. There's a trainer up here. Push the rock to the left of the Grunt to create a shortcut back to the entrance. (Such a short shortcut.) Get up on the eastern rise to fight another trainer. Should I even bother strategizing over these guys anymore? No? Okay. - There are two routes you can take here. We'll take the southeastern route to start. It will take you to a side passage where a trainer waits. You can shove a boulder aside down here to access an intersection; west is a dead end, so head east. 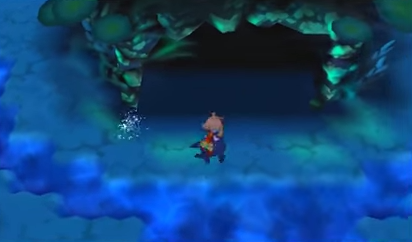 May navigates a boulder puzzle in the Seafloor Cavern. - Hop down the ledge in the next cavern. There's a trainer to the south. Jump off the ledges on the right side of the room, then check the bottom-right corner of the screen for an Escape Rope. The cave down here leads back to the previous room; ignore it unless you need to return to previous areas. Go northeast. - You'll wind up in a large room filled with moveable boulders. (You'd come here if you went through the northwest door in the first room, as well. Just saying.) If you go straight north you'll find an even larger room, filled with Surfable water and water currents; make your way to the west side of this room and you'll find a cave that leads back to the entrance. Unnecessary. - Head north through the boulder room and push the first boulder right, then the second boulder north. By doing this you can get at the northeastern boulder. Push it right to create a path to the exit in the northeast corner. Push the boulder just south of this last one further south to create an easy passage through this room. - Another water flow room. Jump into the lowest flow, on your right, and it will carry you to a tiny calm spot in the north. Hop onto the flow to the north and it will carry you to a central island, where TM55, Scald, waits. Jump onto the northern flow from here and it will shuttle you to the exit in the northwest corner. - Head north in the next room. There's a trainer waiting next to a boulder. Beat him up, then push the boulder south to make a slightly easier path through here. - There's a boulder puzzle straight ahead. It looks intimidating, but it's not that bad at all. Start by picking a side and pushing one of the two southernmost boulders into its adjacent hole. Next, move the second boulder in line towards the middle of the room from the right / left. This will allow you to cross through the middle of the room and push the third boulder down a space. 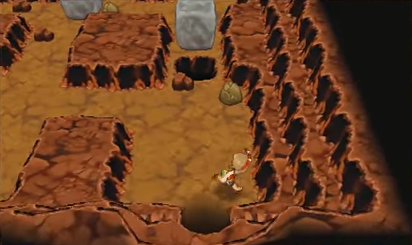 Push the final boulder north into its respective hole to create a path out of the room. 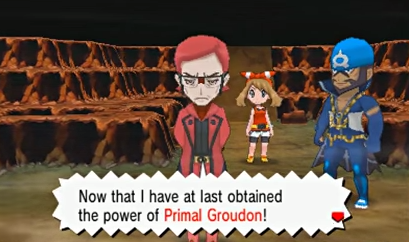 Maxie, triumphant, unleashes Groudon from its slumber. Despite the truly epic circumstances of this battle, it's not that different from your previous Magma / Aqua battles. You're simply facing upgraded versions of other villainous pokemon. The big exception here is the final pokemon, which will immediately be morphed into Mega Camerupt or Mega Sharpedo. Your approach to these pokemon won't change a whole lot, but they'll require more abuse to defeat. Camerupt is more durable, and may put your pokemon to sleep with Yawn; Sharpedo is straight-on offensive power. Use water on one and fairy / grass / electric / fighting / whatever you prefer on the other. - After the Leader goes down, they'll unleash the power of your game's iconic legendary pokemon - Groudon for Omega Ruby, Kyogre for Alpha Sapphire. You'll be shot out of the Seafloor Cavern and up to the surface, where, at least until you solve the issues the villainous team has caused, specific weather patterns will dominate your battles. In Omega Ruby you'll have sunlight status; in Alpha Sapphire it's rainy instead. Also, if you have Glalie, mega evolve it and use Freeze-Dry against Mega Sharpedo. Small detail, but getting to the small island with Scald requires taking the southern current after the calm spot, at least in OR.